One of our flagship programmes with a leading world-class reputation for over 10 years and the first one in the UK to be accredited by the Global Association of Risk Professionals (GARP). The financial system has undergone major restructuring in preparation for the new regulatory frameworks, affecting existing roles and creating different skillset requirements within risk management divisions of financial institutions. This programme is tailored to the needs of the rapidly evolving financial markets, providing graduates with an insight into new innovations in the area of risk management. Through its long-term academic partnerships and accreditations by leading professional bodies, the MSc Financial Risk Management offers a cutting edge learning experience, combining a practice focused approach and current market intelligence. The graduates benefit from exemptions to professional certifications from leading professional bodies worldwide. The MSc Financial Risk Management is accredited by the Global Association of Risk Professionals (GARP). The degree syllabus is enhanced with the most up to date professional practices in the area of risk management, integrating applied academic knowledge to industry needs and providing a competitive advantage to the graduates. Integral to the academic course is the parallel study of the GARP FRM Part I certificate. Upon successful completion of their degree, students will be registered to take the FRM Part I examination. After completion of this programme, students are well-prepared to follow a career in the challenging fields of risk management, or risk analysis with banks, regulators, portfolio managers, corporate treasuries, risk management software houses, specialist financial boutiques and hedge funds. Regulators, governments, advisors and commentators are unanimously endorsing the call for more and better qualified risk managers and analysts to join the financial industry. MSc Financial Risk Management is accredited by GARP and the degree syllabus is enhanced with the most up to date professional practices in the area of risk management, integrating applied academic knowledge to industry needs and providing a competitive advantage to the graduates. Integral to the academic course is the parallel study of the GARP FRM Part I certificate. Upon successful completion of their degree, students will be registered to take the FRM Part I examination. ICMA Centre MSc Financial Risk Management students are eligible for exemption from Exams I and II of PRM Certification. In addition MSc FRM students are provided with assistance to take PRM Exams III and IV. The ICMA Centre is a Chartered Institute of Securities and Investment (CISI) Centre of Excellence. Centres of Excellence are a select group of UK universities, recognised by the CISI as offering leadership in academic education on financial markets. Students who are on a financially-related masters course recognised by the CISI are eligible for exemptions and membership. 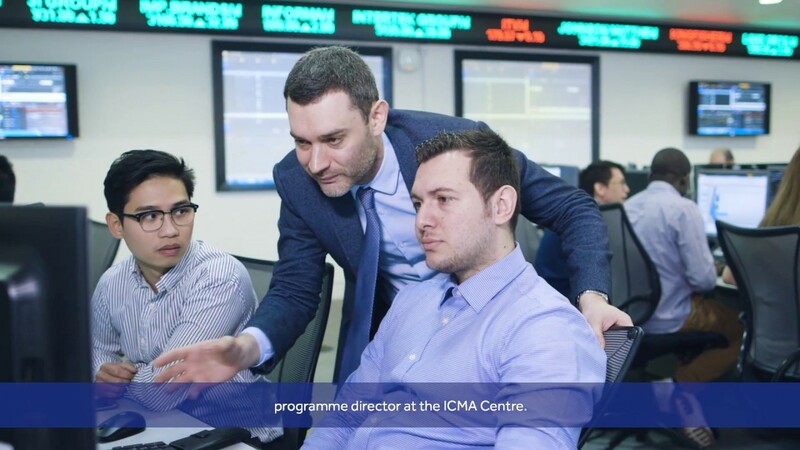 ICMA Centre students who register and successfully complete two CISI Diploma in Capital Markets modules (Securities and Bonds & Fixed Interest Markets) are eligible for an exemption from the third module (Financial Markets). The module provides the economic framework for understanding the global financial system and financial markets, financial institutions, market players and the importance of liquidity and price efficiency. Participants will gain an understanding of the international stock and bond markets, ‘repo’ markets (for borrowing/ lending on a secured basis). The module also introduces foreign exchange, money markets and futures markets (which are developed in more detail in optional Part 2 modules) and also focuses on specific markets for commodity and energy. The purpose of the module is to provide an understanding of the latest developments in banking regulations that are the main driving force behind changes in our approaches to risk measurement. It focuses on the foundations of market risk analysis and the basic models for assessing market risk. Participants utilise market risk measurement techniques that are used daily in the front and middle offices of banks; particular emphasis is placed on the appraisal of the covariance matrices that are used to measure the market risk of portfolios. They also learn to build various Value-at-Risk (VaR) models for market risk for international portfolios of equities, FX, interest rate products, commodities, derivatives etc. The module has a significant practical component with computer-based workshops that are designed to support the lecture material. Having established the theoretical basis for security valuation in Part I, this module extends students’ understanding to the valuation of financial instruments and their applications. The module has a significant practical component with seminars that are designed to support the lecture material. Students will be introduced to all types of risks that are embedded in listed and OTC derivatives across all asset classes. They will become familiar with exotic equity options, understand their pay-offs and some simple analytic pricing approximations. They will value some of the most popular swap varieties, and understand how they may be used for managing risk. They will value caps, floors and swaptions, convertible bonds and understand the interplay between market and credit risk factors. They will outline the basic credit derivatives, including total return swaps, default swaps and collateralized debt obligations. This course introduces students to a set of newly developed techniques to measure and manage credit risk in bank portfolios. In recent years financial institutions have been looking at ways to quantify risk in their corporate loan and mortgage books. The lack of market prices for these types of illiquid assets implies that standard risk assessment procedures can not be employed. The course focuses on (1) default and recovery risk, (2) credit ratings and credit scoring models (3) how to measure portfolio credit risk using contingent claim and credit rating based approaches (4) credit risk management tools and (5) credit risk capital regulation (Basel 2). Advanced Financial Analysis builds upon the material covered in Part I of Fixed Income and Equity Investments. The module focuses on the main pillars of fundamental top-down equity analysis: the primary aim is to provide an in-depth analysis of how the choices presented by financial standards can impact reported company performance and thus investment decisions. The analytical techniques introduced in this module are widely used in equity analysis by financial analysts and fund managers/traders. The module aims to build on the techniques for portfolio selection that have been introduced in the Securities, Futures and Options module. The module examines the issues involved in understanding the investment market, constructing a competitive investment portfolio (of an active, passive or smart beta style), evaluating the performance of that portfolio, and adjusting its composition through time. It will also consider issues revolving around the management of risk. The compulsory, practical project of the course will provide students with hands-on experience in constructing and managing a realistic investment portfolio. This module aims to provide students with a detailed knowledge of the commodity derivatives markets. It examines the aspects of pricing and trading physical derivatives, with emphasis on the energy and shipping (freight) sectors. The course is designed using real-life trading examples, stimulating students, who wish to follow a sales and trading career, to approach derivatives pricing from first principles. This module provides an overview of the purpose and operation of financial regulation, and the consequences of financial sector reform for different markets, including those of the students’ home country. The module aims to deliver a broad insight into the key challenges for financial regulation particularly in the light of changes to the financial architecture in the aftermath of the global financial crisis of 2007. The evolution of algorithmic trading, the proliferation of alternative trading platforms for trading the same security and the development of new products and assets with limited liquidity have contributed to raising the awareness of academics and traders on the importance of understanding and properly managing liquidity and execution risks. The objective of this course is to give students an introduction to the concepts of market and asset liquidity, trade execution risk and an overview of the methods for managing these types of liquidity risk. This module will not discuss about funding liquidity and managing liquidity in a bank. The issues discussed in this course are important when developing trading strategies, valuing portfolios, liquidating large positions and transitioning assets to new investments. Financial theories have traditionally assumed that rational, risk-averse investors trade in efficient and free-flowing asset markets. Academic research and practitioner experience have cast doubt on this paradigm, instead proposing that investors may not be utility maximisers, and that there may be impediments to the functioning of markets. This module will describe recent developments in the application of principles drawn from psychology to financial issues. Bond and Money Markets explores the economic drivers and relationships between bond, money markets and central bank monetary policies. The module offers students the opportunity to gain an understanding of how these connections affect funding liquidity management, trading strategies and the challenges faced by practitioners as well as regulators/policy makers. The course also covers the overall functions, structure and operation of the money market. The main aims of the module are to provide the tools for understanding the functioning of money markets, their connection with bond markets and central bank interventions, the fundamental determinants of interest rate markets and the commonly used trading strategies. If you are ambitious and like to challenge yourself, set high standards and have a passion to succeed then this is the place to be.